This sparkling penthouse condominium in the sought-after Adagio in Bethesda is urban living at its best -- with beautifully appointed spaces furnished with upscale appliances and finishes, and birds eye views of the surrounding cityscape and tree-lined streets of neighborhoods toward the Potomac River.The bi-level condo, on the eighth and penthouse floors, sits on the buildings quiet side, where a private balcony off of the living and dining rooms offers an unparalleled spot for morning coffee and casual meals, while looking out to the cityscape. On colder days, the views are just as spectacular indoor, via the floor-to-ceiling windows throughout the main level, including the living and dining rooms, as well as the master and bedroom suites, both with en-suite baths. The kitchen is a chefs dream with top-of-the-line appliances, granite countertops, a wine cooler and a wet bar. The master suite is also wrapped in luxury with a huge walk-in closet and an all-white designer ceramic bath contrasting the black granite vanity for a striking look!A third bedroom that can be used as a den or home office, with abundant windows and opens onto a large private terrace, completes the penthouse condo that offers all the modern conveniences and elegance one could ask for in urban living: sports club access, 24-hour concierge service, guest suites, resident library, fitness center, community courtyard, two private garage parking spaces, free guest garage parking, two storage units and, of course, walkability to hundreds of shops, restaurants and cafes nearby. 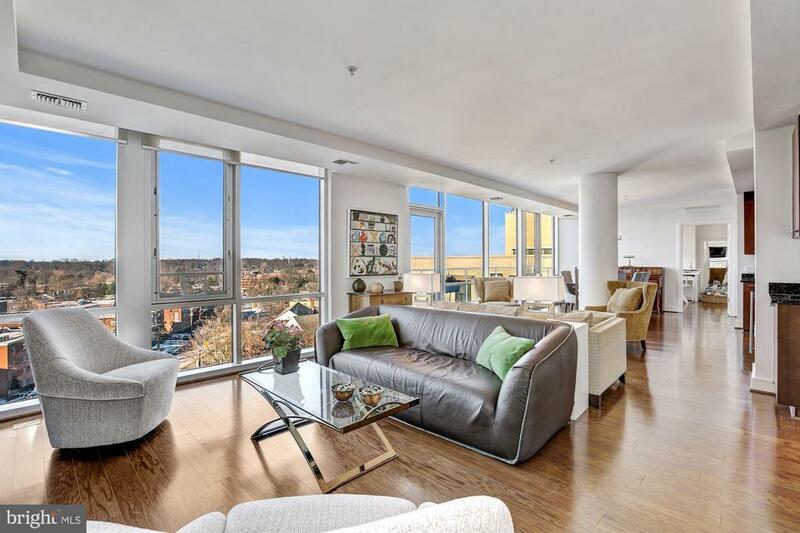 The condo is five blocks from the Bethesda Metro. Welcome home! Directions: Wisconsin Avenue & Bradley Blvd. Enter parking at rear of building from Bradley blvd. , get a ticket, drive around to the left to Adagio guest-parking spaces, then take elevator to Wisconsin Ave. and front desk for key, and parking validation.